(LJF adapted from NASA image) Four distinct layers make up our planet Earth according to geologists. The central, inner core is the hottest, most dense, and probably solid. The next layer, or outer core, is still very hot. The mantle is the layer that gets increasingly cooler as you move toward the surface but is still molten under the outermost layer called the crust. The crust is the outer solid part of our planet averaging 8–32 km in thickness. 2. Outer Core: 2,260 km thick, composed of molten nickel and iron. 3. Mantle: 2,890 km thick, composed of silicates and therefore less dense than the nickel/iron core. 4. Crust: 8–32 km thick (exaggerated here). If the 12,756 km diameter of Earth were shrunk to 12 inches, the crust would be less than the thickness of 4 sheets of paper. 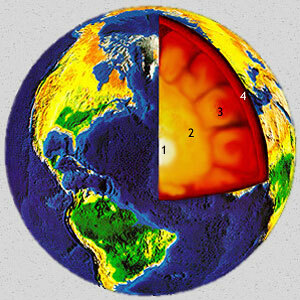 Earth's crust "floats" on the hot, molten layer of the mantle. This molten layer is a dense "magma" that supports the lighter crust. The crust has different thicknesses and composition depending on where it is located. Some of the crust is mostly terrestrial (forming the continents), but much of it is marine (underlying the bottoms of the oceans). The rigid material that floats on Earth's surface is termed the lithosphere. The low velocity plastic layer (molten magma) under the lithosphere is called the asthenosphere. It is believed that heat induced convection currents in the asthenosphere move (or float) the lithosphere. The lithosphere is subdivided into outer rock material that forms the thin outer crust over continents and ocean bottoms (brown and light gray) and a transition zone (solid gray) between the crust and the asthenosphere. The asthenosphere is a subdivision of the mantle that is below the lithosphere and may be 100 to 700 kilometers below the surface. There are many rock types that comprise Earth's surface; however, they can all be classed as either oceanic or continental in origin. Andesitic material (a mixture of oceanic and continental crust) is also found in a few unique areas. Oceanic crust is more dense than continental crust. Oceanic crust is the main crustal unit under Earth's oceans. It is often called basalt. Oceanic crust has lots of silica and iron and may be referred to as simatic. It is generally not much more than 7 km thick. Undersea volcanos composed of oceanic crust may form undersea mountain ranges or oceanic islands (like Iceland, Hawaii, or Galapagos). 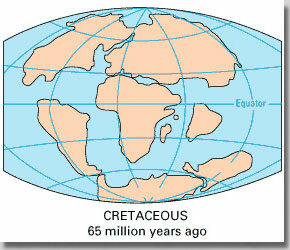 Continental crust generally "rests" on top of oceanic crust and is often called granitic. It is the main crustal unit forming Earth's major continental land masses and a few continental islands (like Greenland, Madagascar, and California's Channel Islands). Continental crust has lots of silica and aluminum and may be referred to as sialic. Its thickness varies from only a few km at the edges of continents to over 32 km in the middle of continents. Earth's crust not only moves on top of the hot molten layer but is broken into pieces that move relative to each other. These pieces are called "plates" and their relative movement can be used to explain many of Earth's geological features (mountain ranges, trenches). Earth's twelve major plates are diagrammed here (above and below). Some are oceanic crust and some are oceanic crust with continental crust. 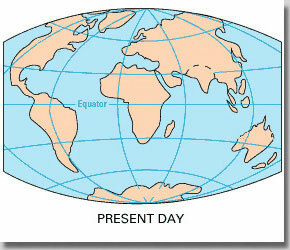 Oceanic ridges/rises on Earth run around the globe like the seams on a baseball diagrammed above in red. Plates are moving apart at oceanic ridges/rises creating undersea volcanos that build an undersea mountain range. This undersea mountain range stretches all around Earth. 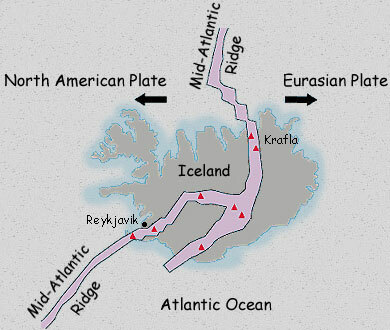 It runs right down the middle of the Atlantic Ocean where it is called the Mid-Atlantic Ridge. The part of this undersea mountain range that runs up the Pacific Ocean in the southern hemisphere, just east of the Central Pacific, and up to the Gulf of California is called the East Pacific Rise. A cross-section of an oceanic ridge/rise shows its general features (above). Oceanic ridges/rises are called spreading centers because this is where two plates are moving apart. It is an area of plate divergence where new crust is added to the diverging plate edges. There is often a central rift valley in the area where much of the volcanism occurs. Most areas have many transform faults that offset the rift valleys and make breaks in the oceanic ridge/rise system perpendicular to the axis of the rift valleys. The mountains on either side of the rift valley are mirror images, getting older as you go away from the rift valley. Iceland, "the land of fire and ice", is being split by an oceanic ridge that surfaces to create an oceanic island (left and below) in the North Atlantic Ocean. Red triangles show Iceland's active volcanos, including Krafla. Reykjavik is Iceland's capital. The central rift valley (above) of an oceanic ridge/rise shows how the volcanism may be found. Each rift valley is unique, some with lots of activity and some with little activity. In the 1970s scientists discovered large numbers of specialized marine animals living near volcanically active areas on the deep ocean floor. These deep-sea hydrothermal vents and their communities have become increasingly interesting to scientists because the communities do not have photosynthetic plants as the base of the food web but have chemosynthetic bacteria. The chemosynthetic bacteria get their energy from minerals dissolved in the seawater by the volcanic activity. This topic will be treated in greater detail in the lesson on The Deep-Sea in the Bottom Dwellers chapter. Most of Earth's deep-sea trenches (aqua lines above) are around the edges of the Pacific Ocean. This map shows the locations of these deep-sea trenches. When two plates come together under the ocean a deep-sea trench is formed. These relatively narrow down-folds in Earth's crust may be twice as deep (almost 12,000 meters) as the regular deep-sea floor (up to 6,000 meters). This is an area of plate movement and earthquake activity from this movement. 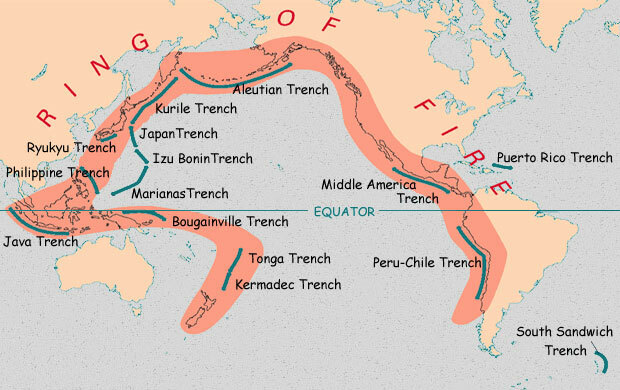 The perimeter of the Pacific Ocean is known as "The Ring of Fire" because of this earthquake activity resulting from this plate movement. A cross section of a deep sea trench shows the collision of two oceanic plates that results in a deep-sea trench. Deep-sea trenches are called subduction zones. This is where excess crust is subducted and melted as new crust is produced at oceanic ridges. Deep-sea trenches are areas of plate convergence. Volcano locations (red squares above) match closely the regions of trenches (subduction zones) and oceanic ridges (spreading centers). The trenches have crustal friction near the surface and deep into the crust as subduction forces one plate under another. At oceanic ridges most of the crustal movement is near the surface as sea-floor spreading causes plates to move apart and new crust is formed by magma pushing up from the mantle. These data from volcanoes, as well as earthquake locations, help to substantiate the model of plate tectonics. Earthquakes that are deep in the crust are found in the same areas as the deep-sea trenches. Earthquakes that are shallow earthquakes (near the surface of the crust) are found at both the deep-sea trenches (outlining the subduction zone) as well as oceanic ridge/rise areas. 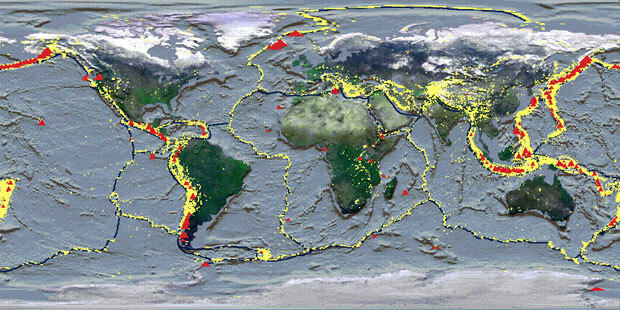 Earthquakes (yellow) and volcanoes (red) outline plate boundaries (above). 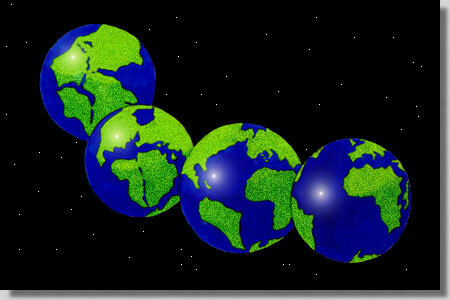 The movement of Earth's twelve major plates may seem slow to us (inches per year) but has a great effect on the position of the continents over millions of years. Some plate boundaries are very active (inches per year) while others are very slow (millimeters per year). Some plates are entirely oceanic crust (like the Pacific Plate) and some are oceanic crust with continental crust (like the North American Plate). Plate tectonic evidence, combined with fossil and geologic evidence, suggests that the position of the continents 200 million years ago were together as one large continent which we call "Pangaea." 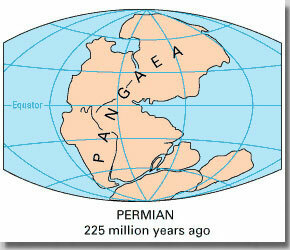 As Pangaea broke up, continental geologic features of Pangaea were torn apart with their fossils as well as populations of plants and animals. The broken up continental pieces of Pangaea moved apart on their respective plates over millions of years to the position we see them now. This idea of continental drift was supported by all the evidence for plate tectonics (like the locations of oceanic ridge/rise systems, deep-sea trenches, volcanoes, and earthquakes). Most of this evidence came from scientific exploration during the 1960s that mapped the oceans of the world. 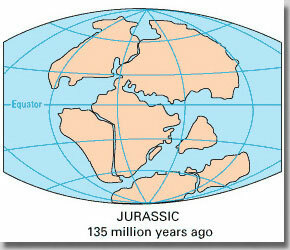 The mechanism of continental drift is called sea floor spreading. The spreading centers at oceanic ridge/rise systems create new crust at areas of diverging plates. This pushes the plates apart and creates collisions of plates elsewhere. Under Earth's oceans colliding plates form deep-sea trenches, subducting old crust (and old sea floor sediments and fossils) into the asthenosphere to melt. These convergent plate boundaries thus act in concert with the divergent plate boundaries subducting and melting crust at the trench systems at the rate it is produced at the ridge/rise systems. Many scientists compare the ocean bottom to a conveyor belt of recycled crustal material. Andesitic crust has characteristics of both oceanic and continental crust. It is most often found near a subduction zone where one plate has a continent that is being subducted. Andesitic crust is found at island arc areas (like the Aleutian Islands) and some continental mountain ranges (like the Andes in South America). 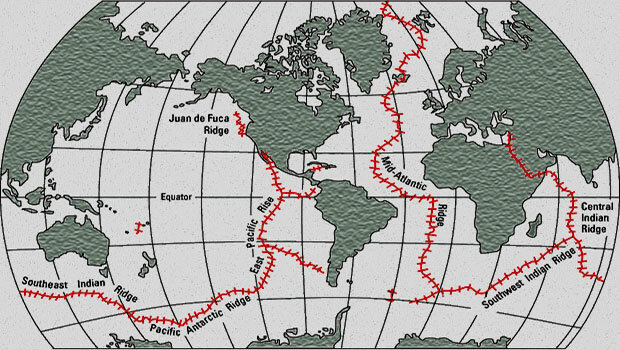 (LJF image) Oceanic ridges are spreading centers creating new oceanic crust at diverging plates. These plates are pushed apart and collide elsewhere forming deep sea trenches. Here, the collision of plates is occurring along a continent. (LJF image) Subduction is folding oceanic and continental crusts down into the asthenosphere where they begin to melt. (LJF image) Andesitic crust was once thought to be a mixture of continental crust and oceanic crust, usually found in regions of subduction. More recently geologists feel it forms from a partial melting of the oceanic crust and changes to the overlying mantle above this crust that may be caused by water in this area. 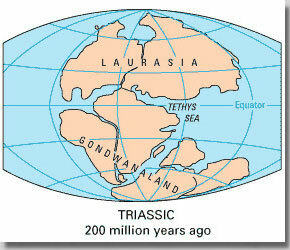 Island arc systems on Earth are made of andesitic crust and are on the continental side of a deep sea trench. The volcanism that produces them often outlines the trench system. Plate tectonics is a very complicated process. It has only been since the late 1960s that scientists have put together enough information to describe this theory and to begin explorations to understand it in more detail. There are some parts of the plate tectonic theory that do not fit neatly. One of these mysteries is the reason for the locations of what are termed "hot spots." These "hot spots" are areas of volcanism not associated with plate boundaries. They may result from an area of the plate that is thinner or weaker than the surrounding area (thus letting magma up) or an area of the asthenosphere that is hotter than average (and thus melts up through the plate). The island chain of Hawaii, in the middle of the Pacific Plate, is a classic example of this. As the Pacific Plate moves in a northwesterly direction over the hot spot a series of islands (or seamounts) results from the volcanism there. The island chain of Hawaii is the result of a hot spot and can be used to show this movement and past movements of the Pacific Plate. The oldest island is Kauai to the far northwest, then Oahu, then Maui, and finally Hawaii. Hawaii is the newest of the Hawaiian Island Chain – still with active volcanism. A new undersea volcanic area is forming just southeast of Hawaii — possibly the next island of the chain. This seamount is called Loihi. The lesson entitled "Hawaii - Born of Fire" will introduce you to Hawaii in greater detail giving you an example of a classic 'hot spot' on Earth.